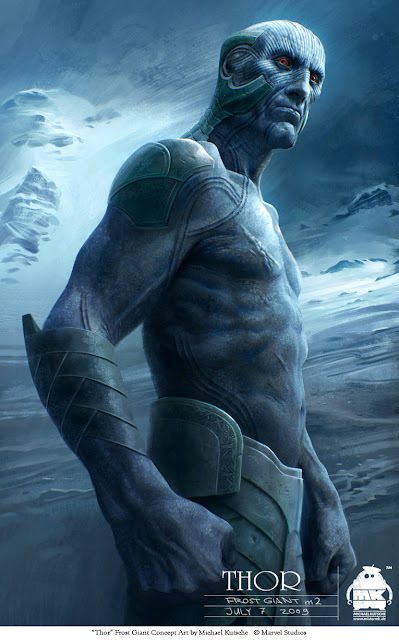 Frost Giant concept art for "Thor", directed by Kenneth Branagh. A big thanks goes to Craig Kyle, Producer at Marvel Studios, for the collaboration on the giants. Sooooo good love the way you render forms! I thought the movie otherwise, even I liked the story. I think if it had been produced with yours illustrations, it would have been more interesting. Excellent work! Love these concepts. It was a pleasure meeting you last weekend (I was the Art Center student with the beard). Its always awesome when talented artists turn out to be nice people, as well. Lovely work, I notice all your paintings are completed to a very high level of finish, are there any intermediate stages you go through beforehand or do you just go straight into the final pieces ? Thanks everyone for the nice feedback! Zachary: Thanks for dropping by at the event, it was really nice to chat with you! Keep up the good work! This is really powerful, thanks for sharing. My art of Thor book is on its way, can't wait! Do you sell actual prints of your work Michael? Colin: Thanks! I've been thinking about doing prints, some day (between projects) I will definitely set up a shop option. That's great news, be sure to announce it on here if you get it rolling! It would also be great if you included 'Thor'artwork,especially the frost giants!I received my copy of the Thor art book. The frost giants section is very inspiring! The side view of the Bull giant is really powerful!